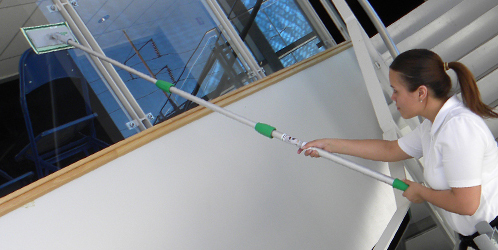 From telescopic cleaning poles to the award winning nLite extension pole, safety and strength go hand in hand with Unger high access cleaning products. Our lightweight, easy-to-assemble telescopic poles reach to height of 60 feet and beyond, keeping workers safely on the ground. Pro Aluminum handles are perfect for preventing bending and back injuries. 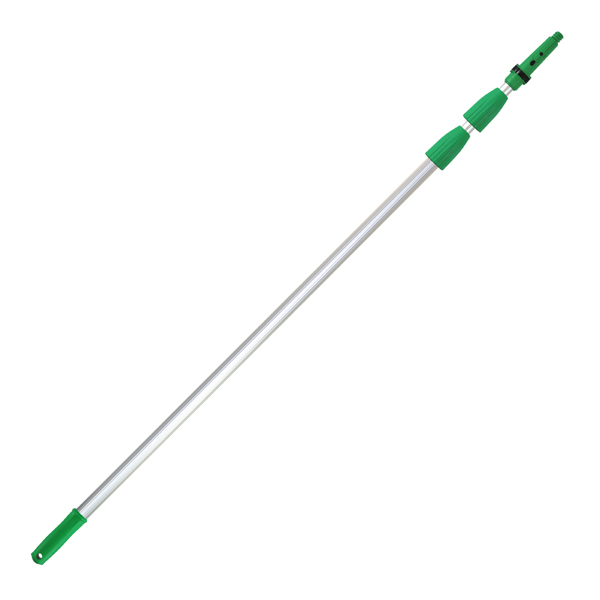 No matter the job, Unger has the right extension pole to meet the needs of your clean. With Unger's telescopic poles, you can clean and maintain a variety of surfaces without the use of cumbersome ladders or lifts, simplifying high access cleaning. When assembled, our anodized aluminum poles are lightweight and easy to handle, providing maximum reach safely from the ground. When used in conjunction with a full range of extension pole attachments - washers, squeegees, dusters, brushes, bulb changers - no surface is left unclean. 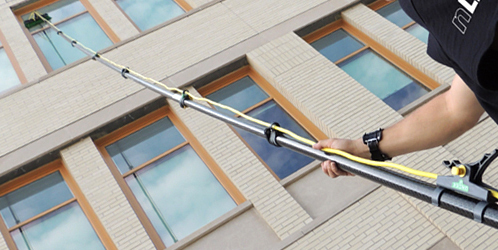 Unger's line of nLite water fed poles keeps workers safely on the ground while reaching heights up to 65 feet, making easy work of high rise window cleaning and dusting, both indoors and out. And when the job is done, the water fed pole easily retracts for convenient carrying and storage. An easier and safer cleaning experience translates to more efficient and frequent high access cleaning processes for your facility. High-access cleaning simplified. Wherever there is a need for extended reach, choose an Unger telescopic pole. All of Unger's poles have ergonomic handles for worker comfort. All fit a full range of cleaning tools - washers, squeegees, dusters, and brushes. No matter what the job, using an Unger pole allows performance and safety to be top priorities. 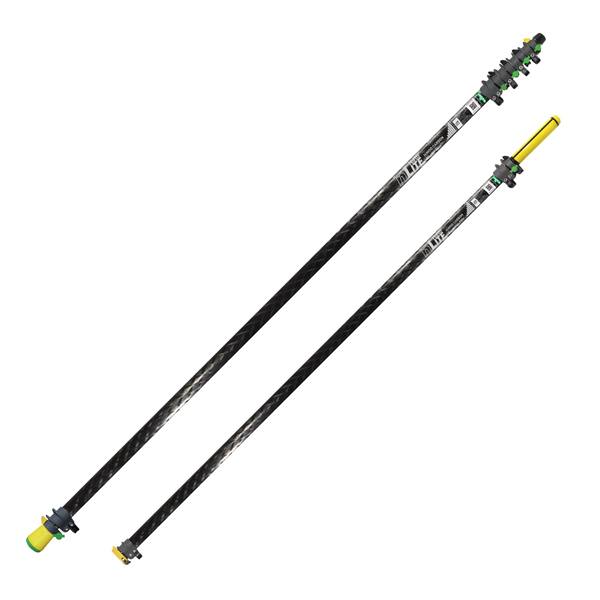 Unger's selection of waterfed poles offer the highest quality for excellent value and rigidity. These aluminum and carbon poles are designed with a yellow visual warning to avoid unintentional separation. 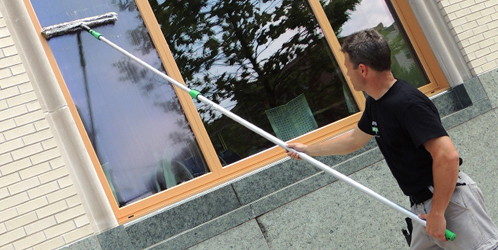 With an Unger Pure Water Cleaning system, your custodial staff can keep your windows, facades, solar panels, and signs cleaner than ever before. By attaching the appropriate adapter, you can expand the cleaning performance of a nLite pole. Clean windows and glass "inside and out" all year long!